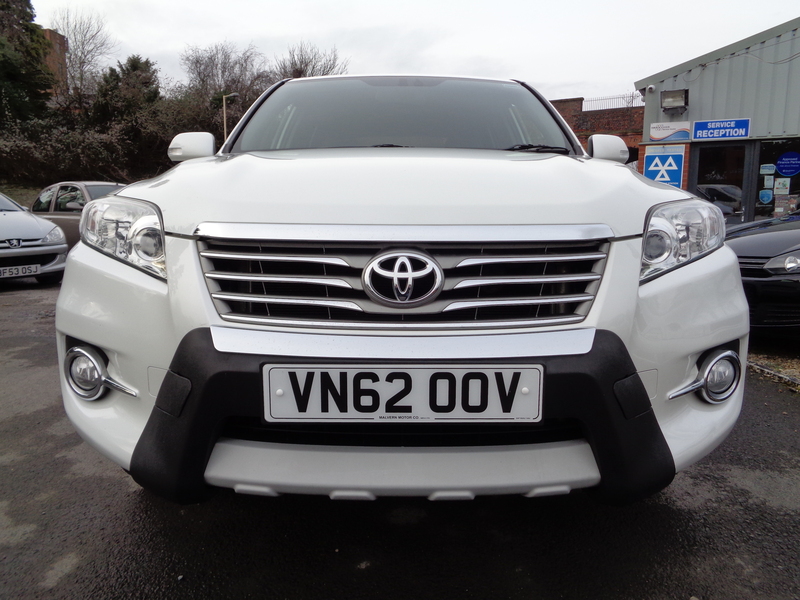 TOYOTA RAV 4 XT-R STYLE 2.2 D-4D TURBO DIESEL 4×4 finished in White Pearl Metallic paintwork with Dark Grey Alcantara and part leather upholstery. 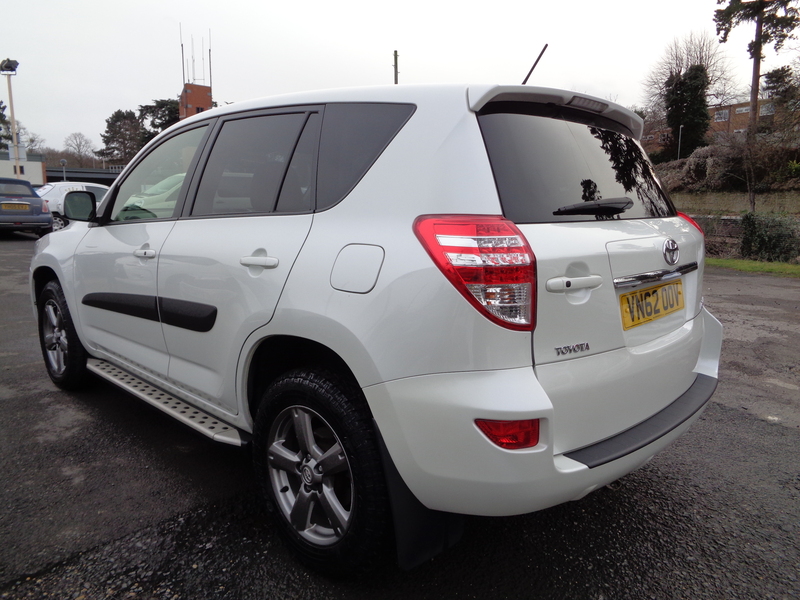 This is a beautiful example of the versatile, reliable and great to drive Rav 4. This vehicle has the 2.2 16 valve D-4D Turbo Diesel engine with 150 bhp, coupled to a six speed manual gearbox. It can return 47.1 mpg on the combined cycle, is a group 26 insurance (on the newer 1-50 scale) and costs £195 per year to tax. Performance is lively too, with a top speed of 118 mph and a 0-60 time of 9.9 seconds. The Rav 4 offers a more car-like feel than some off roaders with well balanced handling, precise steering and a comfortable ride quality too. With its torquey Turbo Diesel engine offering swift acceleration without resorting to high revs and a slick gearchange this is a very pleasant and relaxing vehicle on the road. The intelligent four wheel drive system ensures that in normal conditions the vehicle is only driving the front wheels to aid fuel economy, however when the system detects a loss of grip it quickly diverts power to the rear wheels to maximise traction. If you know there is difficult terrain ahead you can use the manual override button on the dash which ensures the vehicle locks into permanent 50/50 split four wheel drive up to about 25 mph when it reverts to automatic control. There is plenty of space in the cabin – more than enough for four adults to travel in comfort (five would be a bit more of a squeeze in the back though!) 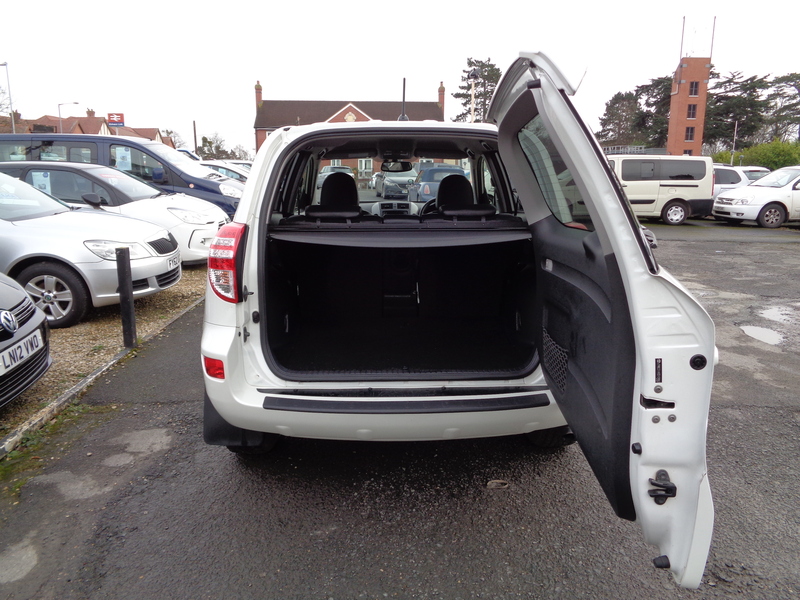 plus a spacious load area with split folding rear seats to extend it even further when necessary. 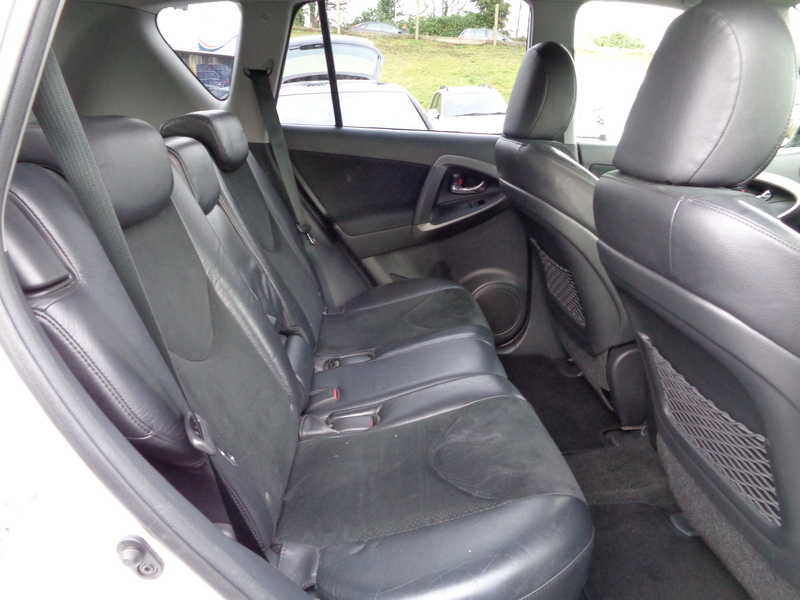 The rear seats are also slide and recline adjustable for maximum practicality. There are loads of handy family friendly features fitted too, such as – a front centre armrest with two integral storage compartments, rear centre armrest with integral cupholders, map nets in the back of the front seats, two front cupholders, lockable and cooled glovebox, front passenger upper storage box, centre console storage tray, front and rear door bins with integral bottle holders, underfloor storage compartments and 12V power socket in the boot, storage net in the load compartment door, front map reading lamps, illuminated vanity mirrors, front footwell illumination, plus drivers seat height, tilt and lumbar adjustment. This should be a very safe vehicle as it scored a four star result in the Euro NCAP crash tests and comes with all the safety gear fitted as standard. This includes – driver and passenger airbags (with passenger de-activation switch), side airbags, curtain airbags, drivers knee airbag, ISOFIX child seat mountings on the outer rear seats, ABS brakes and VSC stability and traction control. 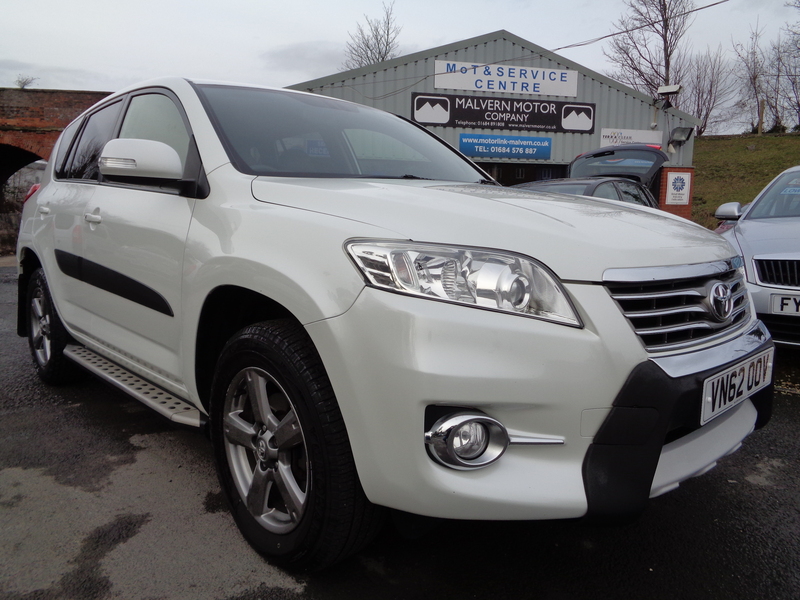 This high spec XT-R model has plenty of goodies as well, spec includes – dual zone climate control air conditioning, electric windows all round, electric/heated mirrors with power fold, trip computer, power steering, cruise control, 17 inch “five spoke” alloy wheels, automatic headlights and wipers, auto dimming rear view mirror, privacy glass, alcantara and part leather upholstery, electrically adjustable drivers seat, heated front seats, remote central locking with keyless entry and start, remote control Toyota “Touch” touchscreen multimedia system comprising an RDS stereo/CD player, Bluetooth hands free phone system, reversing camera, plus an auxiliary MP3 connector socket and USB port. 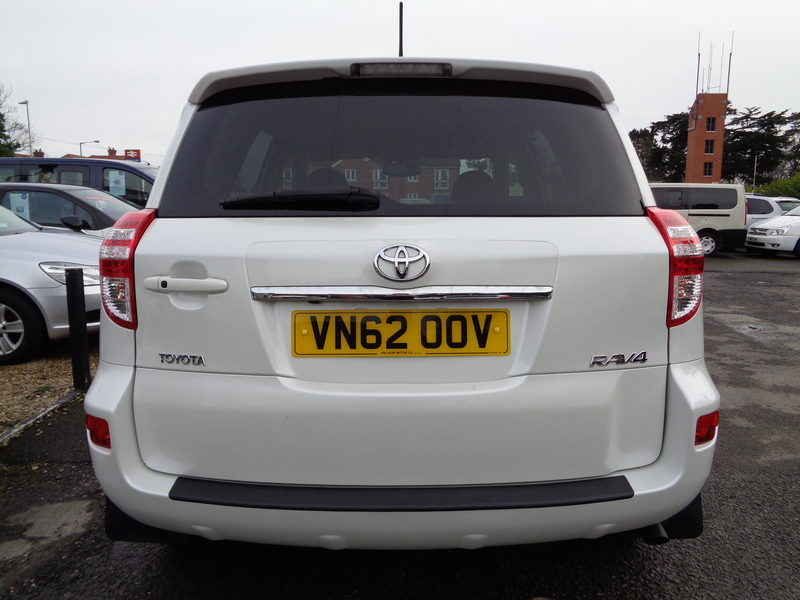 This Rav 4 has a great pedigree. 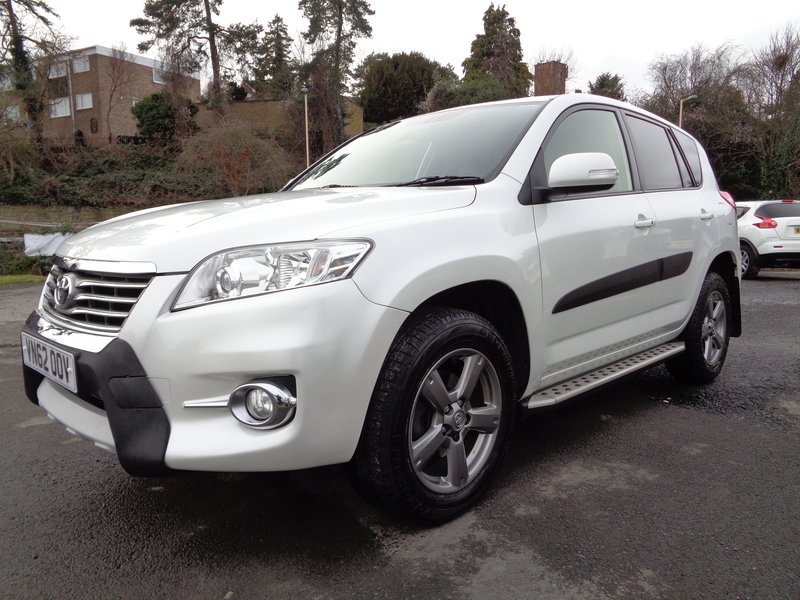 It was originally supplied by Westlands Toyota of Worcester to a lady from the same city, then was subsequently supplied by Westlands Toyota of Hereford to a lady from Abergavenny back in April 2015. We supplied the vehicle in January 2018 to its last owner, a gentleman from Malvern – who has just traded it back in. There is a full service history with seven stamps in the book, the first three from Toyota main dealers and the last four from independent garages. This obviously confirms the sensible mileage of just over 83,000 and also proves that the car has been very well maintained throughout its life. It is presented in beautiful condition throughout, drives exactly as it should and looks superb in its gleaming pearlescent white paintwork with contrasting dark grey interior. It is set off externally by the sporty alloys, chrome trimmed front grille with matching chrome surround front fog lamps and rear door strip, darkened rear windows and Mercedes style door mirror integrated side indicators. 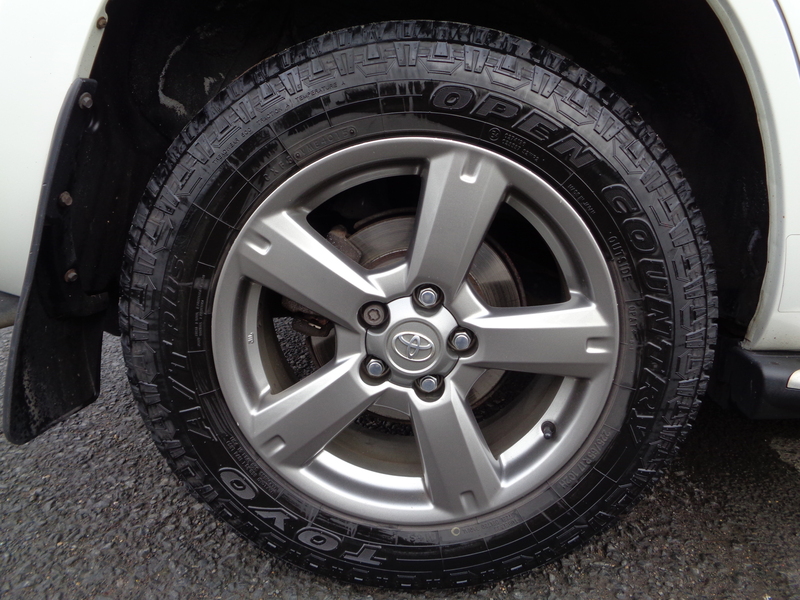 Additionally, this vehicle was specified new with the optional Style Pack which adds the chunky front bumper nudge bar with chrome insert and matt silver skid plate, aluminium effect side steps, side mouldings, rear bumper protector, rear mud flaps and aluminium effect door sill scuff plates. 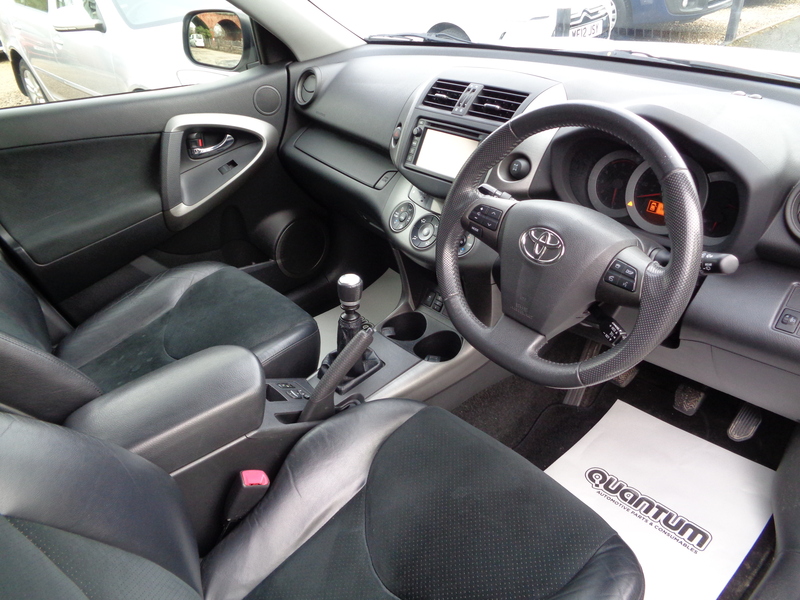 The interior is enhanced by the nice to hold leather rimmed sports steering wheel and leather gearknob, classy suede and leather upholstery, tasteful brushed metallic effect inlays on the centre console, steering wheel, doors, gearknob, instrument dial and speaker surrounds, plus the chrome effect door handles. If you are looking for an ultra-reliable family vehicle with four wheel drive capability and Turbo Diesel economy then the Rav 4 D-4D is one of the best choices you could make. In this price bracket I don’t think you will find a superior example anywhere – this vehicle has an ideal full service history provenance to back up the sensible mileage, a very high specification and on-trend colour combination. 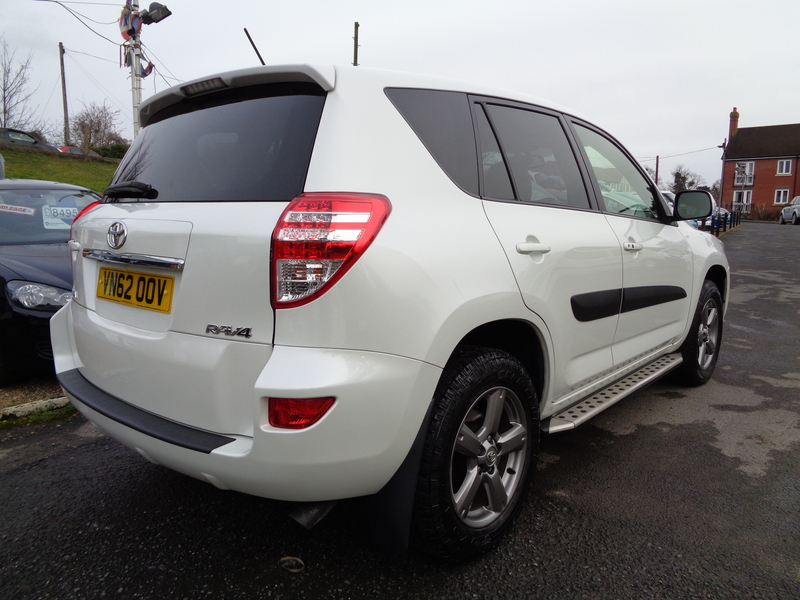 Considering this car would have retailed new for over £26,000 this is a fantastic opportunity now at only £8,995!